Did someone say beach day? Whether you’re getting ready for the summer to arrive or shopping for a warm weather getaway, we bet bikini tops are at the top of your list. At ROXY, when it comes to women’s bikini tops, we’re experts. Our long history of designing quality surf performance and lifestyle products has allowed us to perfect the art of creating the best bikini tops for any of your warm weather activities. Whether you’re looking to have some fun catching waves in the water, or keep things leisurely catching rays on the sand, our bikini tops will keep you looking amazing and feeling confident about showing off your beach body. Choosing the right women’s bikini top is no easy task. We know it can be difficult trying to find the bikini top that is most flattering for your shape, and that sometimes the process of doing that can become overwhelming. But never fear, ROXY is here! We want you to be able to enjoy shopping for your favorite bikini top which is why we design a range of cuts and styles each season so you have no trouble finding one that is the perfect fit for you! To start, the traditional triangle bikini is always a great choice; its simple silhouette and minimalistic coverage makes it the perfect bikini top for sunbathing. If you’re not a fan of tan lines, hit the beach in one of our strapless bikinis or bandeau tops, and catch some rays without having to worry about uneven color. For days when you’re looking for a little more coverage, choose a high neck swimsuit or tankini top to keep you comfortable during all of your beach day activities. The beach is a great place to make a statement about your style. Step up your style game with a trendy bustier bikini top or bralette bikini top. We also have halter tops and crop top bikinis that not only look great at the beach, but pair well with your favorite shorts so you can seamlessly transition from the beach into town. 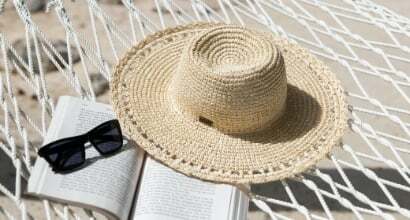 Each summer we do our best to think of everything so that all you need to do is pick out the perfect bikini top that will make your summer more enjoyable. The decision making doesn't end once you’ve chosen the right bikini top silhouette. Really rep your style by selecting the bikini top that features your favorite color, pattern, material, or texture. 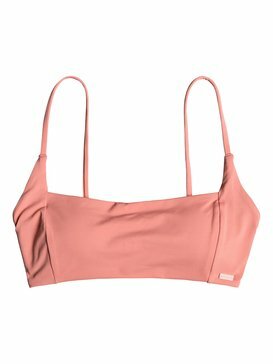 Gone are the days of bikini tops all being the same basic material with color being the only thing to make them unique. These days there are a range of different fabrics and fun texture details to choose from that will keep you standing out from crowd. Our crochet bikini tops are a great summer staple and will keep your beachy bohemian style vibes alive. Take advantage of some texture and add some excitement to your bikini top by wearing a fringe bikini top or a ruffle bikini top during your day of fun in the sun. Express your sense of style through color as well by opting to choose one of our women’s bikini tops in the color or pattern that puts you in a summery mood. A basic black bikini top is like a little black dress, every girl should have one, but summertime calls for options which is why you should have a selection of colors and patterns to choose from so you can look exactly how you like each time you head to the beach. Do you love to online shop? 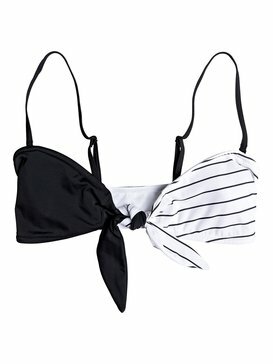 Do you also love sporting your favorite bikini top at the beach? Fuse those two together and you will love shopping for ROXY women’s bikini tops in our online store! Our full selection of bikini tops is easy to browse online so you can buy the styles that you love the most. Not sure which style you want yet? No problem. Our free customer service help line can help you make the right decision by answering any of your questions while you shop via live chat, phone, or email. So start shopping, your perfect day at the beach is just a few clicks away!